Cal Crutchlow’s bid for a fourth MotoGP podium of 2013 got off to a painful and tough start in Germany today after the British rider was left battered and bruised after two heavy practice crashes. Seconds remained in a cool and cloudy FP1 this morning when Crutchlow lost control of his Monster Yamaha Tech 3 YZR-M1 in the braking zone for the first corner. He got gingerly to his feet after rolling several times in the gravel trap but was still able to finish the session with the sixth fastest time. Worse was to follow though for the 27-year-old, who has finished on the podium in three of the last four races, when he suffered another massive fall at the super-fast Turn 11 in this afternoon's second 45-minute session. Turn 11 is a downhill corner taken in fifth gear with a blind entry and also caught out Ducati duo Andrea Dovizioso and Andrea Iannone today. Crutchlow lost the front-end of his YZR-M1 but as he slid down the track face down, he suffered various cuts, friction burns and bruises to his arms, chest and legs. 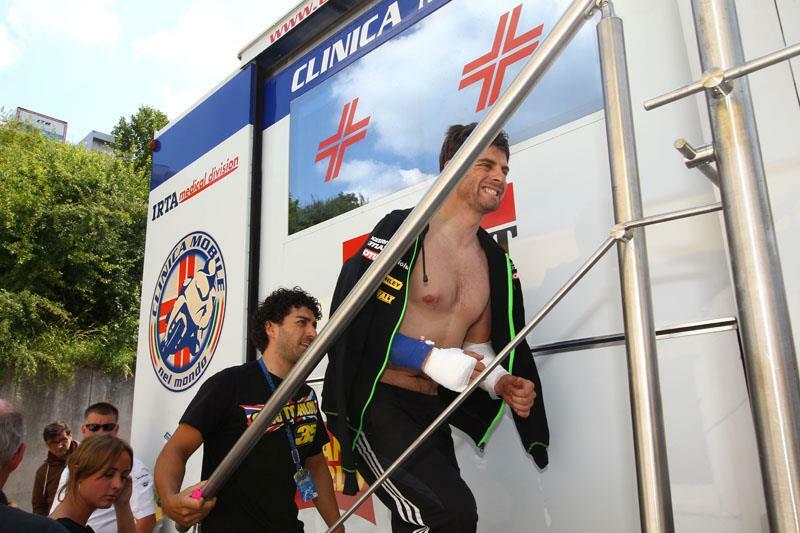 He underwent lengthy treatment in the Clinica Mobile but X-rays fortunately showed he had not broken any bones. He will undergo a further medical assessment tomorrow morning but Crutchlow’s wounds are not severe enough to prevent him taking any further part in this weekend’s action at the Sachsenring. Sufficiently shaken that he was excused of his usual media commitments this afternoon, Monster Yamaha Tech 3 boss Herve Poncharal faced the press to explain Crutchlow’s situation. The Frenchman said: “His injuries are mainly superficial. His right hand is bruised, burned and a little bit cut. Some small pieces of gravel got into his right glove and they had to remove them from his skin and that was a bit painful. The medical team said he should have no problem riding and he has got a friction burn on his left arm but also superficial and he has bruising on both legs. He will have another medical check tomorrow morning but Cal has incredible mental strength and for me I have no doubt he will be able to ride for the rest of the weekend. Since Crutchlow romped to third place in the recent Dutch TT at Assen, he has undertaken a hectic schedule of PR events in Europe and South America. Immediately after finishing behind Valentino Rossi and Marc Marquez in Assen, he travelled to the Silverstone Formula One race as a guest of Lewis Hamilton’s Mercedes outfit. He then flew to Argentina for a special promotional visit in advance of the Autodromo Termas de Rio Hondo track joining the world championship schedule in 2014. And he flew straight back from Buenos Aires to spend time with close friend Mark Cavendish on the Tour de France. Poncharal said his frantic travel schedule had not played a factor in the two high-speed crashes and he added: “It is true that he had a very busy and hectic schedule with a visit to Silverstone for F1 and then fly to Argentina for the promotional event. And then he came back to watch the Tour de France but I spoke to him on Wednesday and he said he had no problem. He said what he has been doing was a good way to relieve the pressure and enjoy himself. He doesn't think is the reason and we saw today he wasn’t the only one to crash.